The screenshots on this tutorial have not yet been updated for the 2.0.x user interface. But most all the rest of the information should be valid, and the user interface is roughly the same, but a bit more easy to use. This tutorial describes the process of storing a coverage along with its pyramids in a jdbc database. The ImageMosaic JDBC plugin is authored by Christian Mueller and is part of the geotools library. Compare the sizes of the 2 files. Lets do a simple example. Given an image with 1024x1024 pixels and a tile size with 256x256 pixels.We can calculate in our brain that we need 16 tiles. Each pyramid reduces the number of tiles by a factor of 4. The first pyramid has 16/4 = 4 tiles, the second pyramid has only 4/4 = 1 tile. Solution: The second pyramid fits on one tile, we are finished and we need 2 pyramids. number of pyramids = log(pixelsize of image) / log(2) - log (pixelsize of tile) / log(2). Try it: Go to Google and enter as search term “log(1024)/log(2) - log(256)/log(2)” and look at the result. If your image is 18000 pixels, the result = 5.13570929. Thake the floor and use 5 pyramids. Remember, the last pyramid reduces 4 tiles to 1 tile, so this pyramid is not important. If your image is 18000x12000 pixel, use the bigger dimension (18000) for the formula. For creating pyramids and tiles, use http://www.gdal.org/gdal_retile.html from the gdal project. What is happening ? We tell gdal_retile to create world files for our tiles (-co “WORLDFILE=YES”), use bilinear interpolation (-r bilinear), the tiles are 128x128 pixels in size (-ps 128 128) , the image format should be PNG (-of PNG), we need 2 pyramid levels (-levels 2) ,the directory for the result is tiles (-targetDir tiles) and the source image is start.png. A few words about the tile size. 128x128 pixel is proper for this example. Do not use such small sizes in a production environment. A size of 256x256 will reduce the number of tiles by a factor of 4, 512x512 by a factor of 16 and so on. Producing too much tiles will degrade performance on the database side (large tables) and will also raise cpu usage on the client side ( more image operations). working containing start.png , start.wld and a subdirectory tiles. The configuration for a map is done in a xml file. This file has 3 main parts. Since the jdbc connect info and the sql mapping may be reused by more than one map, the best practice is to create xml fragments for both of them and to use xml entity references to include them into the map xml. The jdbc user is “postgres”, the password is “postgres”, maxActive and maxIdle are parameters of the apache connection pooling, jdbcUrl and driverClassName are postgres specific. The name of the database is “gis”. For this tutorial, we do not use data sources provided by a J2EE container. The first element <spatialExtension> specifies which spatial extension the module should use. “universal” means that there is no spatial db extension at all, meaning the tile grid is not stored as a geometry, using simple double values instead. This xml fragment describes 3 tables, first we need a master table where information for each pyramid level is saved. Second and third, the attribute mappings for storing image data, envelopes and tile names are specified. To keep this tutorial simple, we will not further discuss these xml elements. After creating the sql tables things will become clear. This is the final xml configuration file, including our mapping and connect xml fragment. 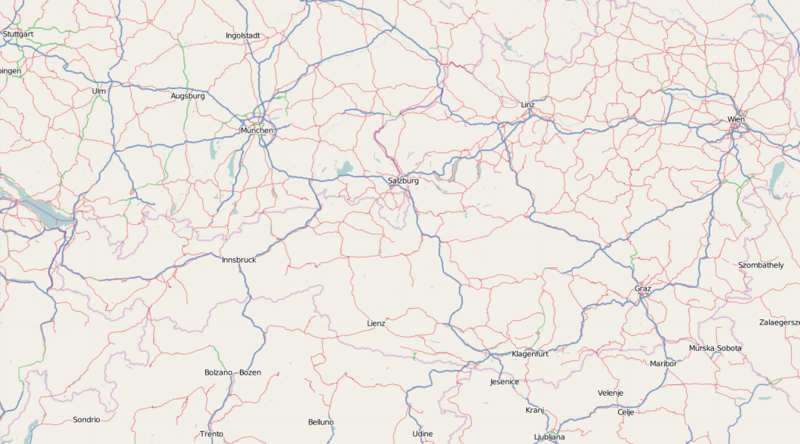 The coverage name is “osm”, CRS is EPSG:4326. <verify cardinality="false"> means no check if the number of tiles equals the number of rectangles stored in the db. (could be time consuming in case of large tile sets). To create the proper sql tables, we can use the java ddl generation utility. This utility is included in the gt-imagemosaic-jdbc-version.jar. Assure that this jar file is in your WEB-INF/lib directory of your GeoServer installation. -spatialTNPrefix A prefix for tablenames to be created. Look into the files createmeta.sql and add_osm.sql and compare them with the content of mapping.postgis.xml.inc. If you understand this relationship, you understand the mapping. The generated scripts are only templates, it is up to you to modify them for better performance or other reasons. But do not break the relationship to the xml mapping fragment. To clean your database, you can execute remove_osm.sql and dropmeta.sql after finishing the tutorial. First, the jdbc jar file has to be in the lib/ext directory of your java runtime. In my case I had to copy postgresql-8.1-407.jdbc3.jar. This statement imports your tiles including all pyramids into your database. Press Apply, then Save to save your changes. 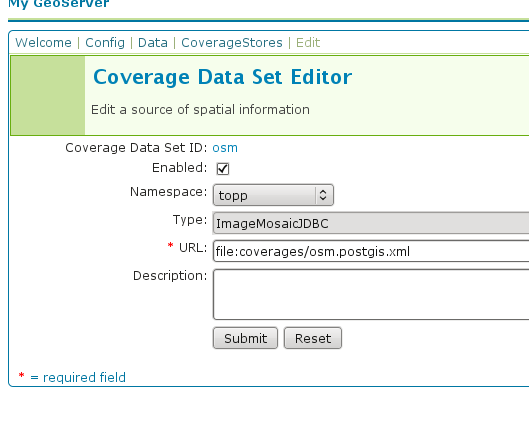 Next select Config‣Data‣Coverages‣New and select “osm”. Press New and you will enter the Coverage Editor. Press Submit, Apply and Save. If you think the image is stretched, you are right. The reason is that the original image is georeferenced with EPSG:900913, but there is no support for this CRS in postigs (at the time of this writing). So I used EPSG:4326. For the purpose of this tutorial, this is ok. There are a lot of other configuration possibilities for specific databases. This tutorial shows a quick cookbook to demonstrate some of the features of this module. Follow the links to the full documentation to dig deeper, especially if you are concerned about performance and database design. If there is something which is missing, proposals are welcome. How many pyramids are needed ?